A Hamburg girl who becomes a true-blue Berliner at the age of seven, Fanny is the first sign of musical genius in the Mendelssohn family. Her father Abraham recognizes immediately that his first-born possesses “Bach's fugue fingers.” As a little girl, she practices the piano so intensively that her relatives grow concerned about her welfare as a child. After the family moves from the city on the Elbe River to Berlin on the Spree River, she receives top-notch musical training at the same level as her brother, who is four years younger. For many years, she serves as her brother’s confidante in artistic matters and he gives her the nickname “Kantor” as a token of her authority. Nevertheless, Father Abraham seems convinced that music should not become a professional calling for Fanny. Felix also discourages his sister: In order to be a professional composer, he warns, it is not a matter of simply composing a work now and again – instead, a composer must regularly edit works and deal with the ensuing critical reactions. And so the pianist, conductor, impresario, and the most important woman composer of the 19th century initially confines her creativity to the semi-public arena: She becomes the promoter and impresaria of the family’s Sunday Concerts, a tradition whose beginnings can be traced to back to her grandmother Bella Salomon’s home on Hackesche Markt around 1820. These soirées evolve into regular events attended by relatives, friends, acquaintances, and members of Berlin society, as well as artists who happen to be in town. With only a few interruptions, these highly regarded concerts continue to be held for nearly a quarter of a century at the glass-domed Garden Hall of the Reck’sche Palais on Leipziger Strasse. 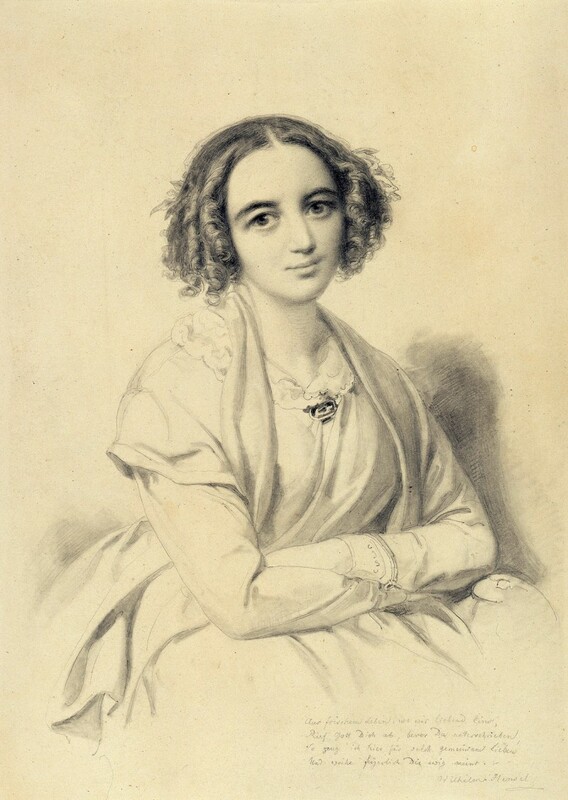 Wilhelm Hensel, Fanny Hensel, 1847, © bpk / Kupferstichkabinett, SMB / Photo: Jörg P. Anders. During this time, the man still hoping to become their son-in-law is awarded a fellowship by the Prussian King to study in Rome. In the Eternal City, he falls in with the devoutly Catholic school of artists known as the “Nazarenes.” The wedding of Fanny and Wilhelm on October 3rd, 1829 in the Berlin Parochialkirche marks the first time that the (baptized) members of the Mendelssohn family are joined to a family without Jewish heritage without the newlyweds having to leave Berlin as a consequence. 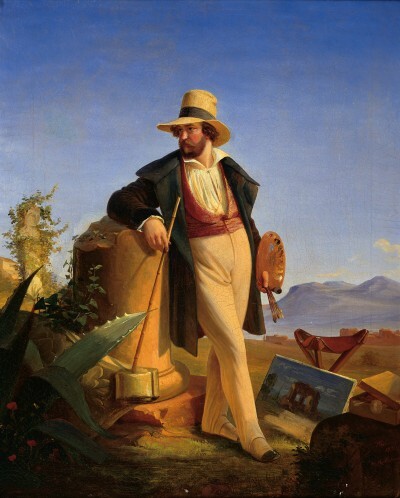 Fanny’s husband Wilhelm Hensel before an Italian landscape. August Theodor Kaselowsky, Wilhelm Hensel in der Campagna, 1841, Stiftung Preussischer Kulturbesitz / photo: Jörg P. Anders. Letter written by Fanny Hensel to her absent brother Felix on her wedding day in Berlin on October 3rd, 1829. 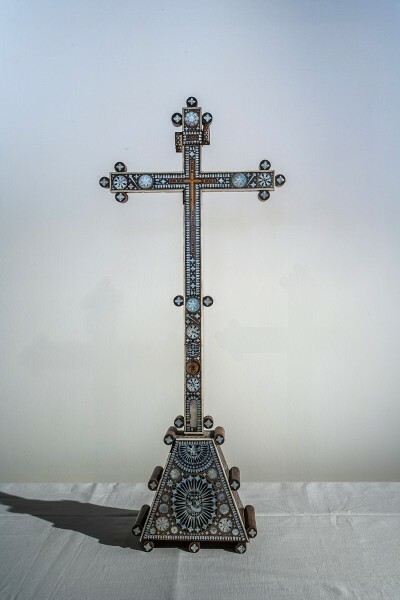 The “Turkish Cross,” a souvenir from Fanny Hensel’s second trip to Italy. SBB / Musikabteilung mit Mendelssohn-Archiv / photo: Manfred Claudi. Over 450 musical works have come down to us from Fanny Hensel, née Mendelssohn, whose surname was “Mendelssohn Bartholdy” from the conversion of her parents in 1822 until her marriage in 1829. More than half of these are Lieder for solo voice; the rest include pieces for piano and organ, for a choir, orchestral works, as well as chamber music, cantatas, and an oratorio. Some of her early Lieder are published under her brother’s name. The first work published her own name, “Ave Maria,” is printed in England. Six booklets of Lieder and piano pieces appear in 1846/47. While drawing on small-format works to gather experience in composing and performing, she uses the demanding Sunday Concerts as a forum. 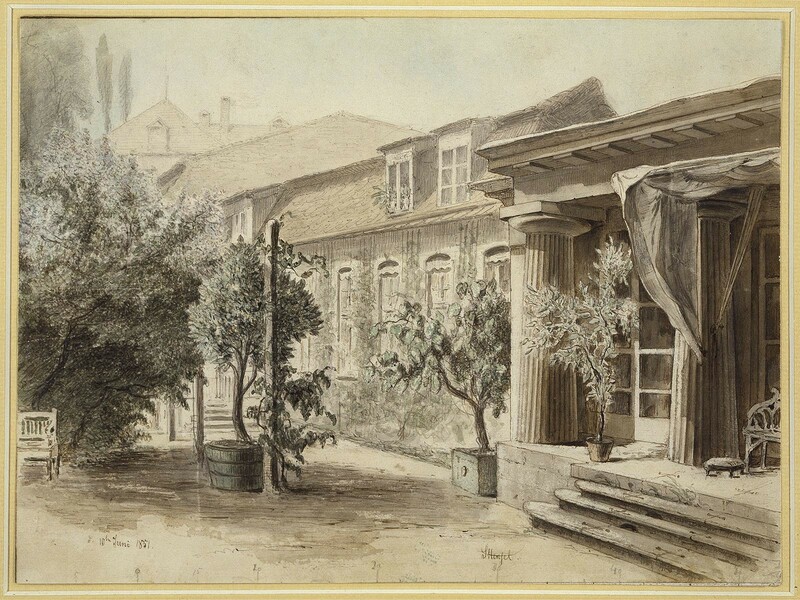 Here, between 1825 and 1847, she performs music with professionals and amateurs drawn from family and friends. Cantatas by Bach are staples of the program, along with works by herself, her brother, and other contemporaries. Her first big trip to Italy with her husband and their ten-year-old son Sebastian becomes her fondest memory, particularly the companionship and professional recognition she receives from fellow artists at the Villa Medici in Rome. Fanny’s music room with piano, sewing table, and paintings by her husband. 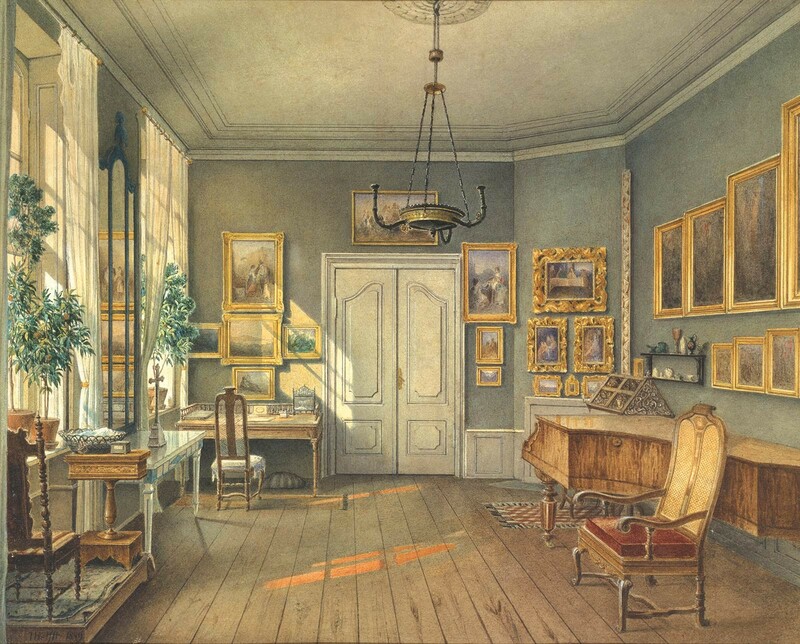 Julius Helfft, “The Music Room of Fanny Hensel,” 1849, Cooper Hewitt, National Design Museum, New York. When it comes to playing at home for the audience in the Garden Hall – which can comprise up to 250 or even 300 friends, scholars, and other Berliners – the clever, witty, warm-hearted, discerning, and politically aware Fanny is able to fully display her talents as hostess, event organizer, conductor, pianist, and composer. She almost never plays in public, however, giving only three piano recitals Berlin. This despite her impressive interpretations of Beethoven, with which she initially outshines her brother. Felix acknowledges his sister’s musical energy after watching a female piano virtuoso perform in Milan: “Sometimes no longer able to squeeze out the sound, she begins to sing along, with a voice that really seems to come from deep inside, and so she often reminded me of you, O Fanny, although you are of course far better than she is.” (1831). The entrance to the glass-domed Garden Hall on Leipziger Strasse 3. Sebastian Hensel, “The Garden Hall,” undated © bpk / SBB. Fanny, who is highly self-critical, plays several demanding roles at once: She is mother to her son Sebastian, wife and back office secretary to her artist husband, as well as a composer. Her husband’s studio is next to the Garden Hall, where she presents Berlin’s best private concert series. And so guests sometimes go straight to Wilhelm Hensel’s studio after a concert to sit for a portrait. The Mendelssohn Bartholdys’ Reck’sche Palais on Leipziger Strasse becomes not only a home but a temple of the muses for the musician and her painter husband. “She was never so hale and hearty as in these last weeks and on the final day of her life,” writes her brother Felix on June 3rd, 1847, devastated by the sudden twist of fate: “While directing and accompanying the chorus in ‘es lacht der Mai,’ she felt unwell and left the room [...] four hours later she was no longer alive. On her final morning, she had set to music a lyric poem by Eichendorff, which closes with the words: ‘Thought and song fly way into the heavens.’ ” Her sudden passing at a rehearsal for one of the Sunday Concerts is only the first in a series of deaths that hits the family hard. The house and garden at 3 Leipziger Strasse are sold. It is the end of an era. 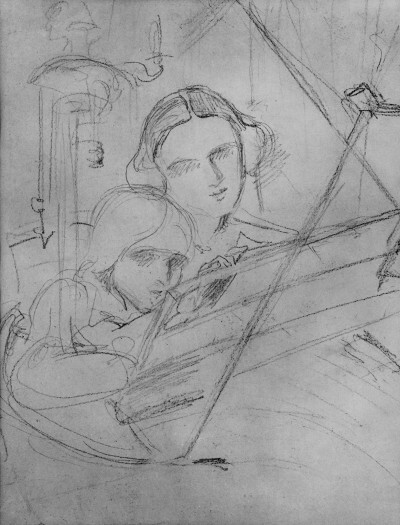 Wilhelm Hensel, “Fanny Hensel and Her Son Sebastian at the Piano,” 1840, SBB / Musikabteilung mit Mendelssohn-Archiv © bpk / Staatsbibliothek zu Berlin.